Today it became generally known that MySQL has aquired a company called Netfrastructure. This company offers a product which is a reimplementation of the Firebird database architecture, combined with a web-based application server front end. It was designed by Jim Starkey in the late nineties and combines a database, a custom java virtual machine and a web server. Jim Starkey is also the principal author of Datatrieve, Rdb/ELN and InterBase, which became Firebird after being open-sourced in 2000. Since the aquisition of InnoDB, by Oracle, MySQL has been in a difficult position: InnoDB was the centre piece of its 5.0 release. It has been discussed extensively in the Firebird community that MySQL should make a strategic move and use Firebird as its enterprise level relational/transactional engine. MySQL chose this path — in a round-about sort of way — by making the aquisition of Netfrastructure and hiring Jim Starky, owner of Netfrastructure. Jim had recently been contributing to the Firebird project, under contract by one of the project’s sponsoring companies. This move by MySQL validates that Firebird has the most mature and featured full open source code base and seems to indicate that the MySQL database product will be moving in similar paths from now on. MySQL also stands a lot to gain from the fact that the Firebird project has about 50 developers working on this architecture and helping to drive it into the future. The Firebird project gains from a well-known name and large sales force introducing its technology to customers world-wide. Market researcher Evans reported early in 2005 that MySQL was used by 40% of developers, immediately followed by Firebird with 39%. The acquisition means that the Firebird architecture will be the most popular on the planet with a very large margin. A lot of work will probably need to go into getting MySQL and the technology behind Netfrastructure to work together. A lot of testing will also be needed since, due to the low number of deployments of Netfrastructure, its finesses remain largely unproven. It will be interesting to see how MySQL clients will react to this move and the eventual downgrade of InnoDB support. Will they wait until MySQL completes the Netfrastructure port, or will they choose to move to Firebird directly? Netfrastacture is equal to Firebird (from architectural POV) in the same degree as to PostgreSQL or InnoDB. Do they all transactional and MGA? Yes. Are they designed and implemented the same way? No. So I generally disagree with this article, as it tends to mix NFS and FB together. IMHO, the FB architecture has much less priority in the MySQL move. What do you consider to be the priority in the MySQL Move? In the short term, they need a working storage engine in their ownership. Hence they buy NFS and Jim. I don’t know whether they’ll be developing their own engine from scratch in the long term (with help of Jim and Ann) or just improve NFS. Time will show. But their major priority is the robust technology and code which is immediately available, whatever architecture it is. It has nothing to do with the FB architecture per se. The same way you could write about Oracle as they own Oracle/Rdb which was Rdb/VMS which was developed in DEC where Jim used to work, so “this move by Oracle validates that Firebird has…” 🙂 Sorry for being a bit sarcastic. than to build them yourself again . To be more specific, Netfrastructure differs from Firebird in its memory usage, write strategy, and underlying relational language. Firebird is very frugal with memory. In addition to a page cache, Netfrastructure has a shared, multi-generational record cache. In Netfrastructure, only committed records are written to disk – a technique called “non-stealing” if I remember correctly. version of the database on disk at all times. Netfrastructure writes committed data to a log file which is emptied to the disk database. After a crash, Netfrastructure must run a recovery program. Firebird databases are ready to use immediately. Firebird is based on a binary relational language representation – BLR – designed to handle different relational languages including SQL, QUEL, Data Language, etc. Netfrastructure is a SQL engine. Is this your first contact with Firebird? 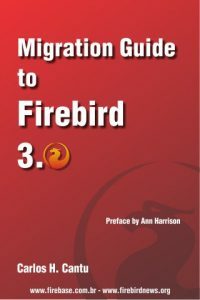 I invite you to read the “Get to know Firebird in 2 minutes” paper and find out why Firebird is so special!